Thoughts (11) – Cadran publishes a series of blogs and articles about the ideas surrounding Business Intelligence in combination with Oracle JD Edwards ERP. In these items various considerations and reflections are discussed, which can be helpful in making the right decisions in the implementation and application of both systems. This blog discusses Oracle BI as a Cloud solution. The Cloud: Hype? Buzz-word? Or just the new world? I explain things soberly. 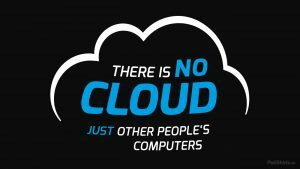 Years ago I came across a tile reading: “There is no such thing as the cloud, it’s actually somebody else’s computer”. This is the truth. Large companies such as Amazon, Microsoft and of course Oracle offer supercomputers for use by companies wanting to buy, manage, maintain, back up, availability and infrastructure of such large pieces of hardware and software. With a subscription, the use of these types of systems can be scaled flexibly and accurately for each unit of time, per user and / or per transaction, by what is needed. Nohting new bascially. For years hardware and software have already been outsourced to data centers. Actually, the same construction is involved, with the difference that there is no scalable subscription, but the worries of the system are in the hands of an managed service party. The terms “private cloud” or “public cloud” sometimes cause confusion. Actually, there is also no physical difference between this, except that a public cloud can be accessed via an open internet connection and that a private cloud is behind a secure VPN connection or the firewall of the domain of the corporate network. This is a functional difference and not directly physical. Within this framework, many refinements are possible, such as “Storage as a Service” (StaaS), development tools, such as “Java as a Service” (JaaS) and also web services (Integration as a Service). In addition, Oracle offers ready-made software solutions and systems as a cloud service, including ERP and HRM. Works with a corresponding database on Oracle Database 11g, which is called “Schema as a Service”. The desired data has to be loaded to that database to make nice dashboards with BICS. That means that data is not real-time in Oracle BI, but when the ETL process is frequently scheduled, it is possible to reach near-real-time data. Has very limited management functionality. Is automatically updated by Oracle when a new version of the software is rolled out. Works with the Database as a Service (DBaaS) service, which runs on Oracle Database 12c. Is scalable to the number of CPUs of the underlying server. Contains in addition to DV and BICS also EssBase (separately licensed). Is not updated automatically. Software updates and patches are offered in a management console, which the administrator can roll out when needed. Is capable of accessing many more possible data sources, including even an on-premise database. This allows for real-time data. Has many more security options, which make it possible to connect partly or completely within the the company’s domain, behind a VPN and / or behind the firewall. Cloud services are an increasingly natural part of our daily lives. With smartphones, tablets, laptops and smart TVs, we increasingly use services offered in the cloud in our daily lives. Technically, of course, the sky is the limit. But what about the security and privacy of our data? Especially when we look at Oracle BI, it might be very convenient and easy to view all those nice dashboards in a cloud service. But who else can see that? And what happens to the data (with all trade secrets and competition-sensitive information)? And Oracle is still an American company and therefore the NSA can also use my data? With a subscription you choose the country / continent where the service is hosted. Oracle has also had a large data center in Amsterdam for a few years now. All data is heavily secured and stored encrypted. With OAC it is also possible to secure the connections between environments (eg BI and Database and on-premise database) with VPN, Firewall and Network Domains (up to and including certificates and security keys and dual authentication). If you do not consider this safe enough, it is even possible to install Oracle cloud products within your own network, so on-premise. The management can then still be outsourced to Oracle. In other words: If Oracle ever had a security leak and sensitive business information becomes public, they can stop their cloud services. In addition: even if you opt for the datacenter in Amsterdam, Oracle still performs everything in triple (for backup & recovery and for high availability and fail-over). So if the NSA would like your data, it will probably be possible, but perhaps that is already the case. The fact is that everything is evolving towards the cloud. The fact is that when we go into the cloud with Oracle BI, we can use the thickest and fastest hardware (ExaData machines) and the fastest database technology (Oracle DB 12c with InMemory and ColumnBasedSearch technology), with its management and maintenance outsourced to Oracle and we almost automatically stay up-to-date with the latest version of the software. And if we need more users or power, we can easily scale up the subscription. Of course, there are critical notes to place with software in the cloud. We have to conform to the functionality that is offered in it, like any app on our mobile phone. This may be limiting for ERP systems in the cloud, but my experience with Oracle BI is that this functionality lends itself perfectly to cloud service.